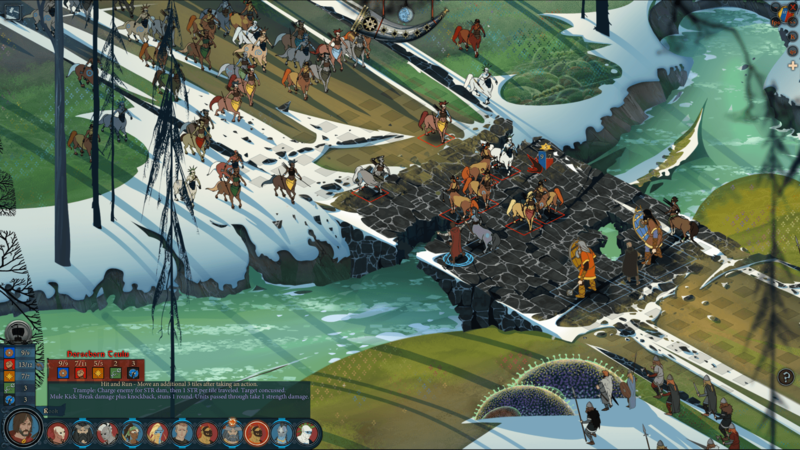 As a sequel, The Banner Saga 2 does exactly what you expect it to. 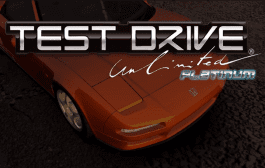 It picks up almost immediately where the original game left off, even allowing a save import from the original so the plot-altering decisions you made carry over. 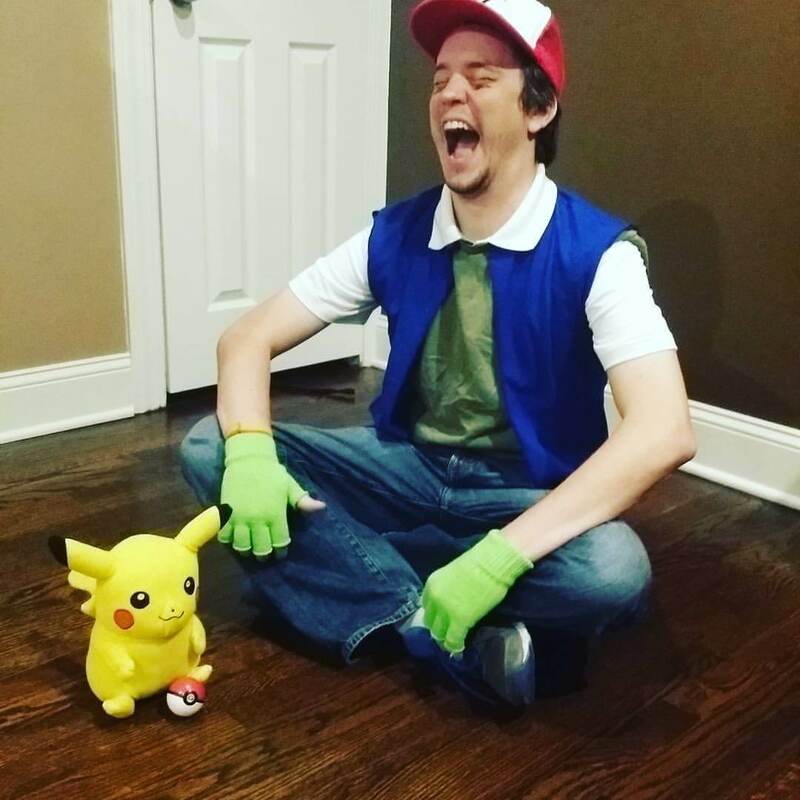 It improves on many aspects of the original game, and (although they are improved) suffers from some of the same drawbacks. The Banner Saga 2 is a wonderful game, with beautiful aesthetics, strategic battles and resource management, and a compelling story. Bolverk, the black-haired Varl, and Folka, his advisor, are two new central characters. 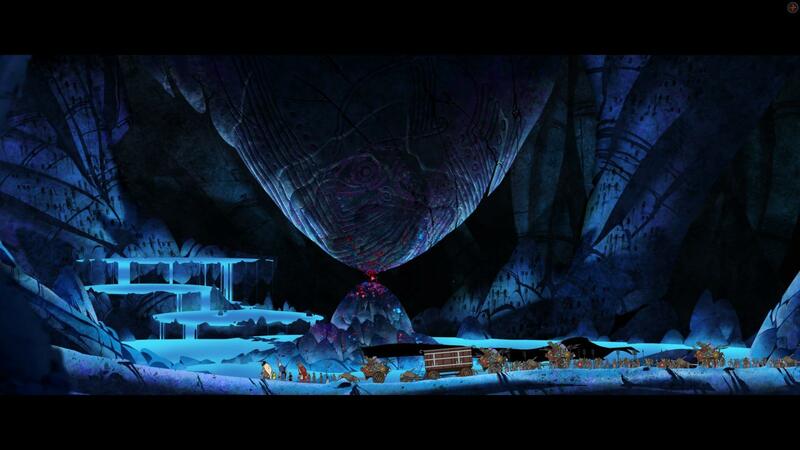 The first thing that stands out in The Banner Saga 2 is the art. The bleak Viking world returns, with much more variety in locations than the first game. Swamps, forests, and caves serve as backdrops in addition to the more recognizable snow-swept mountains. The different locations help ease a big issue with the caravan portions of the game. In the first, the beauty and music could get overwhelmed by a sense of “sameness,” with your ragtag clan marching across too similar locales and not capturing the sense of a long journey. The beautiful music makes a return as well and adds to the epic sense of scale. Finally, more voice work and cutscenes help flesh out the characters. Granted, there is still a lot of reading in The Banner Saga 2, but some of the monotonous aspects of the first game are better broken up. The beautiful visuals and music draw you in, but its really the story and characters that keep you invested in the game. 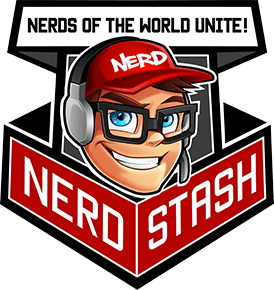 A save from the first game can be imported, or the player can just randomly generate their decisions from it, including which character (Rook or Alette) is going to lead the group. These characters both present a very different story: Rook suffers heavily from his losses, and has become nearly suicidal. He charges into battle against impossible odds and has little patience for people who do no follow his lead. On the other hand, Alette struggles with a lack of experience in both leading and fighting. Her journey is more transformative than Rook’s, but both are an interesting way to experience the game. A new Varl (the race of giants who are near extinction) character, Bolverk, also takes over much of the show and brings an entirely different perspective onto the trouble facing the world. All these characters are fleshed-out and believable, and it is easy to pick favorites and invest into the world of the game. There are plenty of new, interesting environments to explore. There are two areas of gameplay in The Banner Saga 2. The first is the resource management, decision making “caravan” portion of the game. This section is virtually unchanged from the first game. You must make difficult decisions, keep an eye on morale and supplies, and balance the amounts of soldiers and foragers you keep. It is a system that rewards planning but is not completely brutal when mistakes are made. It will definitely punish poor planning, but it is not a game-ender, like in a game of Darkest Dungeon or something similar. 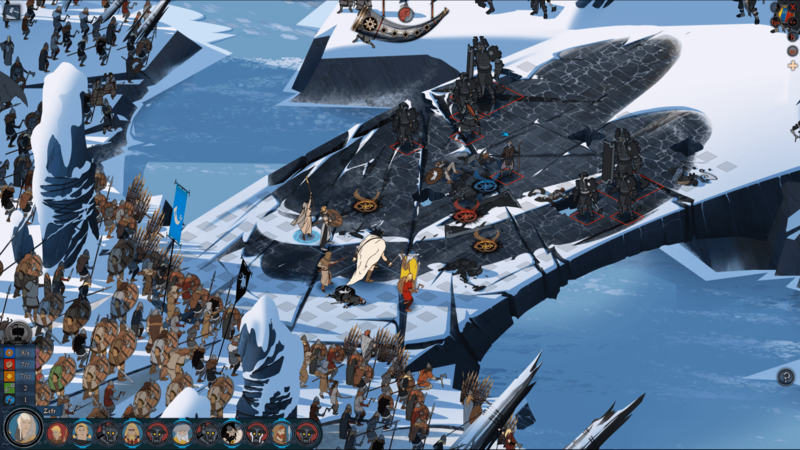 The other gameplay in The Banner Saga 2 is the grid-based tactical combat, and most of the game’s changes impact this area. The most impactful are the new hero types. There is a wide variety in the types of fighters you can use, which makes you feel more in command of your fighting style. It also defeats the monotony of battling the same three dredge unit types that plagued the original. There are a variety of battle objectives that add intensity to combat. Sometimes your objective will be to kill one specific unit on the battlefield, such as a commander. Other times, swarms of enemies will attack as you struggle to clear barricades or ready ships. The battle variety greatly improves on something that was already a strength in the series. New twists make battles more interesting this time out. Not every change in The Banner Saga 2 is a vast improvement. The AI still needs some work, and some battles will be decided by the enemy being a fool. Repeatedly walking through hazards, trapping themselves behind obstructions, not finishing off nearly dead heroes: this AI is not Alexander the Great. That is not to say that combat is easy, but some battles end in odd, anticlimactic ways. There are still some out of the blue events that feel a bit cheap, and there can be some drudging elements. Finally, it suffers a bit from “part two of three” syndrome. 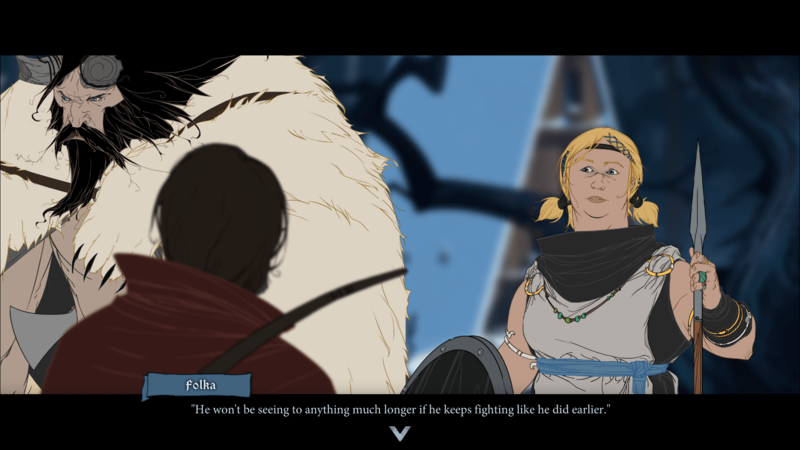 Whereas the first game felt like a self-contained narrative that left itself open for a sequel, The Banner Saga 2 is definitely moving the pieces in place for a third game. 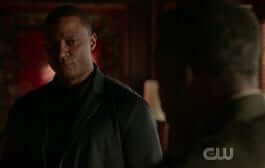 This can cheapen the resolution of this tale a bit, as not every character arc reaches a place that feels fulfilling. However, there are centaurs now. Nitpicking aside, The Banner Saga 2 is a very good game. The tactical combat has a lot of strategy and variety, and the resource management sections can lead to some agonizing choice. The art direction and music are both beautiful, and the interesting characters lead to plenty of interesting drama. It is highly recommended to anyone, especially fans of the first game. Gameplay: Lead your troops in grid-based combat. Manage resources. 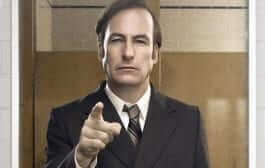 Make dramatic decisions that will seem right when you make them, but will probably get people killed. Graphics: Beautiful hand-drawn style. Bleak, but inspired, a variety of locations. Crisp animation. Sound: Excellent soundtrack adds to epic Viking feel. Sound effects are generic. Presentation: Cool setting and world. Lots of surprises. Minimal UI allows graphical admiration. Lots of text. 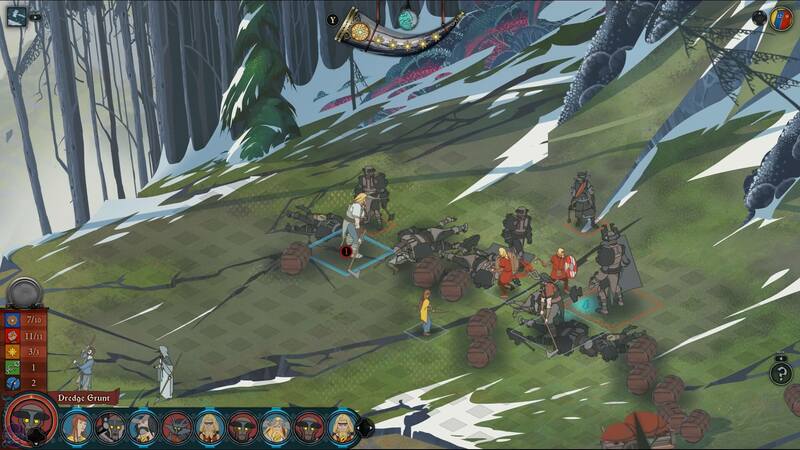 The Banner Saga 2 is a tactical RPG and resource management game set in a dying Viking world. 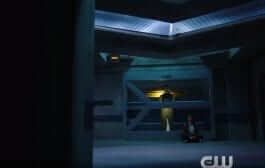 It is developed by Stoic, which is made up of former Bioware developers, and published by Versus Evil.